Fed up having to removing the lens cap, and/or loosing it? 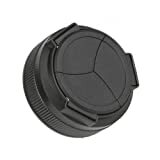 The JJC Auto Lens Cap has been developed to resolve this problem by opening and closing automatically in sync with lens movement. Utilizing hinges, it opens and closes automatically with the extension and retraction of the lens. Without touching the lens cap, the camera responds instantly to sudden shutter opportunities by just turning on the power. Protect the lens with a lens cap that can’t be lost or forgotten. To fit the lens cap press the button on the front of the camera and remove the ring surrounding the lens. This entry was posted in Discount Photography and tagged ALCG1X, Auto, Canon, lens, PowerShot by Ball Photo. Bookmark the permalink.